Sometimes there are recipes that you just know will be superstars. That people will go crazy for them. On my blog it's anything with chocolate, baking that involves bananas or any kind of savoury fritters. THEN there are those recipes that I hold very dear but are a quieter kind of star. This one is definitely one of dishes that might not light the internet on fire but that I wish I could serve up to each and every one of you. It's my kind of soul food. I find it so utterly comforting. I always sleep so well after a big bowl of this for dinner. I've given you a recipe for the noodle soup but honestly once you've made it once you can play around with what you decide to include. Sometime I heap it with noodles and other times I use only veges and include finely shredded cabbage or zucchini noodles as my noodle substitute. The only rule I consider essential is to make sure your broth is well seasoned. I often find the flavour is completly transformed just by adding a little extra salt. Place the raw chicken, carrot, onion, celery and garlic into a large soup / stock pot. Cover with cold water. This will roughly be about 5-6 litres. Bring to a boil. Reduce to a simmer and cook for 1.5 hours with a lid slightly ajar. Remove from the heat and use tongs to remove the chicken. Leave to cool for about 10 minutes or until it's manageable to handle. Remove all the meat from the bones ( as much as is possible) and return the bones and skin to the pot. Place this back on the heat at a simmer and cook for a further 1.5 - 2 hours. The chicken meat can be shredded and placed in an airtight container in the fridge until ready to use for soup. Add the parsley stalks and dill to the broth and cook for the final 20 minutes. Remove from heat and Ideally leave the broth to sit for 20 minutes before straining (don't worry if you don't have time). Strain through a sieve, discarding the bones and vegetable pieces or saving to make a second stock..
Add the salt and stir well. This broth can be stored in fridge for 5 days in an airtight container or frozen for up to 6 months. Most of the time I'll use half for dinner that night and freeze the other half to use later. 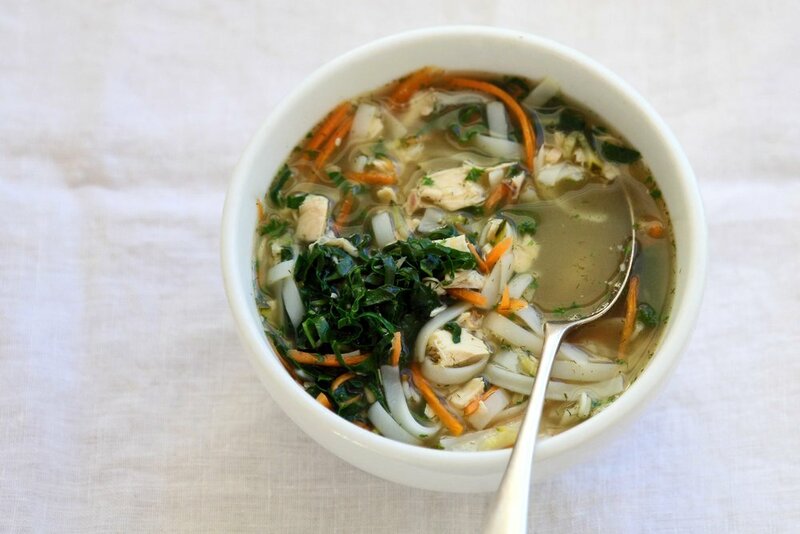 Now that you've got your delicious broth you can turn it into some soulful chicken soup. Cook the rice noodles for slightly less time than the package recommends (they'll continue to cook in the hot soup). Drain well and run until cold water to comletely cook. This stops them getting gluggy or over cooking. Heat broth until boiling. Add the vegetables and cook for just 1 minute. Do not overcook as they'll continue to cook in the hot broth. The vegetables are also best when they still have a little bite and retain their bright colour. Add the noodles and cook for just 10 seconds before removing from the heat. Taste and season generously. A well salted chicken broth is the key to a delicious soup. Use kelp noodles or konjac noodles as an alternative noodle. Grate a (grated) thumb size piece of fresh turmeric to the broth at the start of the cooking process. This will add some anti inflammatory goodness. Add some miso paste, a dash of toasted sesame oil and a little butter (trust me!) to your noodle soup for an Asian umami flavour explosion.